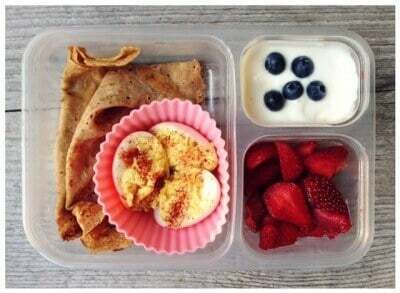 How about starting fresh in the new year with wholesome packed lunches for your little ones? 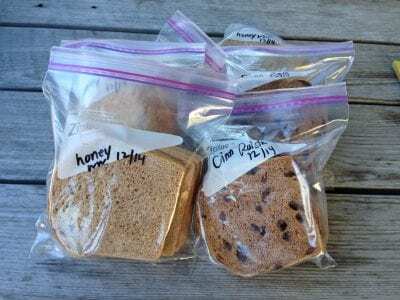 My #1 trick for packing real food school lunches – even on those nights when I am feeling tired and uninspired – is making lunch items in advance and freezing them. I would seriously never survive this chore otherwise. And let’s not forget the importance of starting to pack lunches (or at least having a plan) the day/night before school. Planning ahead is key when it comes to cutting out processed food! So, since you guys liked my first post on this topic so much, here I am again with a new and updated list of items to make and freeze for school lunches! Be sure to check out the original post for info on how exactly to freeze and defrost soups, muffins, etc. Whether it’s to accompany a serving of warm soup or to beef up a snacky cold lunch, my daughters never met a muffin of mine they didn’t like! And these in particular are two of their favorites. So even though my daughters don’t actually mind the crust, they still think uncrustables are fun to make and eat. Plus, the fact that I can make and freeze a big batch makes my life so much easier on some days! It’s hard to go wrong with chili this time of year! 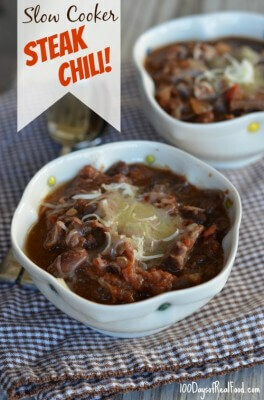 But I have two options for you (both made in the slow cooker) – either Steak Chili or Red and Green Veggie Chili. Leftover crepes are not commonplace around here, but you could always make a double batch for a fun surprise in a breakfast-themed school lunch. When you find a good source for bread, it’s a great idea to stock up. 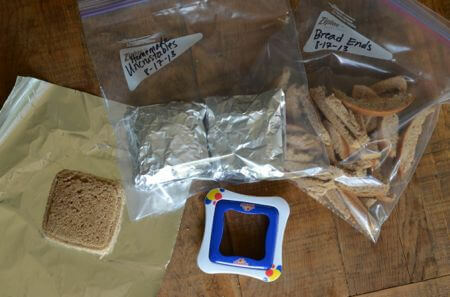 I divide loaves from Great Harvest into three or four Ziploc bags and freeze them. I love how their honey whole-wheat loaf is made with only five ingredients (whole-wheat flour, yeast, salt, water, and honey) and holds up really well in the freezer. You can always make your own too, of course! This soup is a great way to get a dose of green veggies. I sometimes even add noodles to it when I pack it in the lunch box, which my kids love. Bonus: I also love to freeze fresh organic berries in the summer to use all winter long to top off yogurt and add to muffins for the lunch box! Happy New Year! Thank you for the post. I have a question: how do you wrap the sandwiches/muffins so they don’t get freezer burns? My mom hit up on a great idea. She freezes 5-cup Salad in single servings. It’s sweet and creamy, almost like ice cream. What’s 5 -cup Salad? Mix one cups each detained crushed pineapple, mandarin oranges, mini-marshmallows, shredded coconut, and sour cream. These are fun but my goodness they are fattening! My kids are a little overweight so we’re looking for healthier lunches for them and even though these are “real food” they really aren’t very healthy! I would love to see you do a few lunch options for kids that are real food and also not with the hundreds and hundreds of calories and fat. I know *you* don’t count calories and fat because you don’t think you need to (and you probably don’t… you all are so thin!) but for those of us that do, it would be nice to include once in a while… or even just once! Ive made many of these recipes before, and they are not as high in calories and fat as you may think. The key is portion sizes – one of the whole wheat crepes has about 90 calories, so of course if you’re eating 5-6 (which sometimes I do becuase they’re so delicious) it’s not going to work if you’re trying to lose weight. That being said, why don’t you try substituting one of the sides with fresh cut veggies and hummus or a side salad, and you’ll be able to minimize calories that way. I really don’t think it is at all fair or accurate to characterize any of these recipes as fattening or unhealthy (the muffins and crepes are treats and sides which means a small portion occasionally (still much fewer calories than a gross 100 calorie pack of any junk)…. The pizzas made on the mini whole wheat pitas (I split them bc my kids like thin, crisp crust) from Trader Joe’s are a family fave. The pita’s are high in fiber, the pizza sauce I use has 0 grams fat and only 15 calories for a generous serving – pile on sautéed onions, peppers, mushrooms with a sprinkle of cheese and a healthy, fulfilling, snack, lunch, dinner is ready! Pair with a side salad or cut up veggies and this often becomes dinner. The red and green chili is very light and the steak chili is also delicious without meat or by subbing turkey. I think it only takes commonsense to make these recipes lighter if you feel you must. I still use all my old favorite cook books but make real food substitutions or leave/add ingredients to make them light or more nutritious. 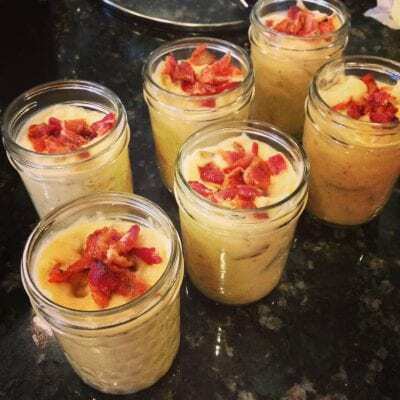 Ellie Krieger has delicious light recipes also that my family loves. I love this sight, but don’t depend on it for recipes (I love to cook and seek out new recipes), but is certainly a wealth of knowledge and ideas for eating real, nutritional food. Yea, A FEW of them are fattening if you eat five servings in one sitting. It’s about eating real food, being satiated and not inhaling half a bag of chips a few hours later due to a sugar crash from the soda and white bagel for breakfast. Fat is not fattening. Sugar is. empty calories are. if you don’t get calories from empty carbs or sugary drinks, you can enjoy a bowl of broccoli cheddar soup w absolutely no problem. the reason *they* don’t count calories is bc they aren’t going over their dietary needs NATURALLY. they don’t need to bc they’re eating properly! counting calories is pointless unless you’re trying to control how many emptyccalories you’re trying to squeeze in without gaining weight. Good luck w that! Thesla, calories are just units of energy. You have to get your “energy” from a healthy source. It’s not the number that matters, it’s the quality of the foods. If you make these foods with high quality ingredients such as pastured butter, coconut oil, and other good quality saturated fats then they are not “fattening” and the calories don’t matter at all. Fat does not make you fat. Sugar and processed chemicals and hydrogenated oils make you fat. Even if you are overweight you do not need to count calories. You just need to switch the fake fat in your diet to real fat and healthy sourced foods. If you ADD lots of grass fed butter to your diet you will be healthier. Your brain needs it to work right, your body needs it to have energy, and it helps your body to absorb all of the nutrients from the other foods you eat. Do your girls have access to microwave or eat all of the previously frozen foods cool? She has a lot of thermos recommemdations for soups. She doesn’t send soup cold, but a lot of other things thaw so they are chilled by the time the girls eat. Thank you for the reminder that school lunches can be a breeze and varied with a bit of planning ahead! I’m always thinking about dinner in these terms, but needed some good lunch ideas. We love your book and will use many of the recipes. The key is to balance out the higher calorie foods with some raw fresh foods like veggies and fruit. But a 5 yo needs the calories to get through the afternoon! I second Liz’s question. These look tasty, but in my opinion most would need to be warmed up to be palatable—at least for my kid. So, not really solving the question of what to pack for a school lunch. 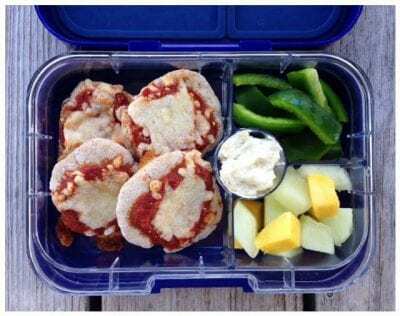 I homeschool and lunches are afterthoughts, but I would love to get more organized and think ahead to have these yummy lunches ready to go so I’m not scrambling around. Thanks for all your great ideas!! Girls (and guys)- it was a beautiful, wonderful, life changing day when I got my first 10 year old. I have 3 kids over 10 now, but the year you turn 10 in our home you get to join the fantastic (not) chore of packing lunches! I homeschool, but 2 days a week my youngest 2 go to a cottage school & have to take lunch. I have a little card they follow so everyone gets plenty of healthy stuff to eat (it just says: protein, fruit, veggie, crunchy ). I check the boxes to be sure no one is gonna starve. But they do the packing. Yea! they are great at it, and even write notes to stuff in their siblings lunch boxes sometimes. Precious. What do your kids take to drink for lunch? What do they drink besides milk or water at home? Hi Brenda. Lisa’s girls stick mostly to milk or water. That’s not to say there aren’t exceptions occasionally. The same is true with my kids but they also enjoy sparkling water with a splash of juice. The soup is in a thermos, they will keep heated food warmed for up to (and maybe longer) than five hours. My daughter uses one and she always says her food is still warm. Also, I’m confused about the “fattening” statements? I don’t think they are fattening, but even if they were, fat is not the enemy. Well I have your book finally. I borrowed it from the library and dh said he thinks we should give this a go. I am so happy!!! I have been trying to get him on board with this for the last couple of years. Thank you so much for writing a book! God Bless you and your family! Thank you for this great list!! Happy New Year! I ordered a Yumbox for each of my kids and they love them! I have three kids – 11, 10 and 8 and the new containers have made packing lunch so much easier. Also, love the recipes – I have potato soup in the crockpot now for dinner tonight! Thank you for all of the information. Lisa I added chopped kale and red peppers to the quiches before I added the egg mixture and they are delicious and perfect for this weeks challenge! What brand are the silicone cupcake molds that are in one of the pictures? I’d love to buy some, but want to make sure I get good ones. Thanks! Hi Rachel. 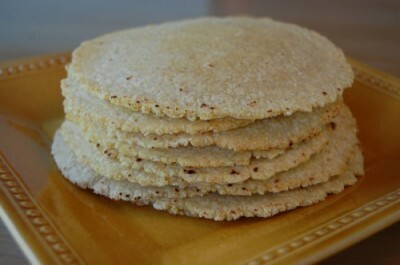 You can find them here: https://www.100daysofrealfood.com/2012/08/24/my-favorite-school-lunch-supplies/. I made your slow cooker potato soup tonight from your cookbook. It was so good, and so easy to make! My husband loved it. Do your kids heat their lunch or eat it cold? Heating isn’t an option for my kids. Heating at school isn’t an option for her girls either. Is there a particular thermos brand that you recommend? I would love to be able to pack soups for lunch at work! Hi Melissa. 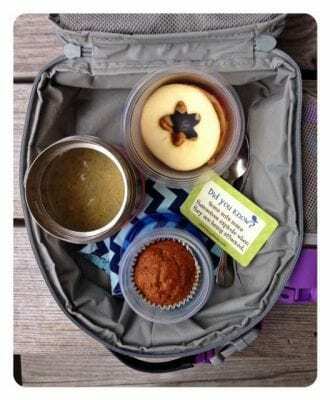 You can find the thermos products that Lisa buys here: https://www.100daysofrealfood.com/2012/08/24/my-favorite-school-lunch-supplies/. 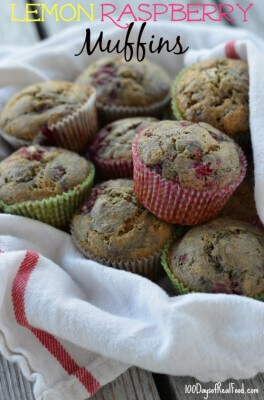 I made the lemon raspberry muffins with blueberries since I didn’t have raspberries. I didn’t even get any frozen they were so delicious! Thank you for the recipe. I also love all the recipes in your book one of our family favourites is the while wheat biscuit recipe. We are a new family to your blog. Keep up the great work! My husband gave me your cookbook for Christmas, and I/we love it! We have 3 children and they are a big fan also. Just wanted to let you know we appreciate you making this journey easier for us. Be blessed! I have tried both muffins, the pizzas, potato soup, and the quiches(I added some spinach to mine). Everything was delicious and works well for lunches. Thank you for these meal ideas. Are your kids able to heat up some of these meals at school or do they eat them cold, like the chili for example. Thanks again! 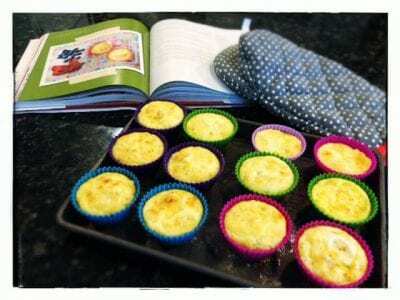 I gave my daughter your cookbook and she is in heaven with your recipes. Her boys (one has asperger’s) are so finicky, but she has found lots of things they like in your cookbook. I intend to have my 7 day challenge again – using your web site directions – this semester with my college freshmen. If you recall, I said they found the challenge completely opened their mind to processed food issues and they all changed their eating habits after doing the challenge – which, by the way, is not easy to do when you live on campus, often miss cafeteria hours, and have to use the coffee shop or food dispensers as a meal choice. Keep up your wonderful web site. What brand and size bread pans do you use? I need my bread to be taller than what I’m getting when I make it. Hi Hannah. Not sure what you are asking. Most of Lisa’s bread recipes are for the bread machine. Her bread machine is a Panasonic: https://www.100daysofrealfood.com/my-kitchen-essentials/. Thank you so much for the lovely photos. Just showing them to my boys gets them on board! I started using the Lands’ End lunch sacks and Ziplock containers (wish they’d bring them back – I got the last ones on the shelf at my Target) and they love it and it makes it so easy for me. Are you going to do school lunch roundup anymore? 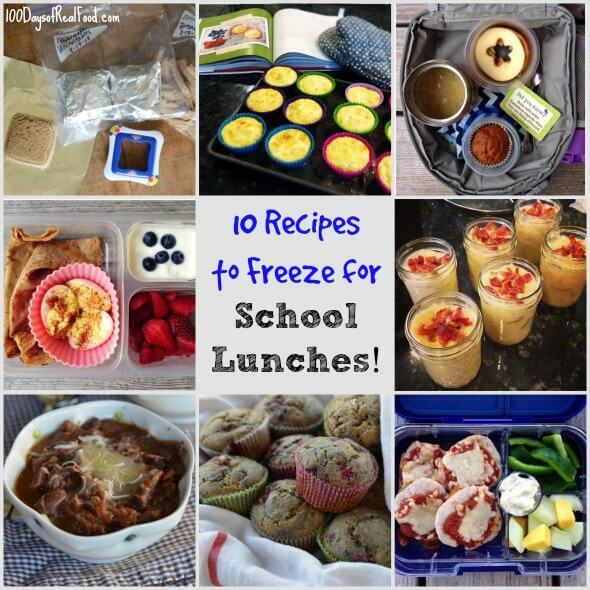 I love all of these ideas, but I’m wondering if your kids eat the soups and tacos cold? I feel limited on what I can send with my kids because they don’t have a way to heat up their food and I worry that things like chicken won’t stay at a cold enough temp with their freezer packs, to be safe to eat. Any tips would be greatly appreciated! Hi there. We use a thermos for keeping soups warm and multiple ice packs to keep other items cold.